Objective: Minimally invasive esophagectomy (MIE) is increasingly being incorporated into armamentarium of different techniques for esophagectomy. We report our initial experience with MIE and compare the outcomes to patients who underwent traditional TH approach. Method: A retrospective review was conducted of 14 patients who underwent MIE at a single academic institution from January 2008 to September 2008. These were compared to patients who underwent open transhiatal esophagectomy between 2001 and 2006. The two groups were matched in age, BMI, comorbidities, and tumor stage. The charts were analyzed for demographic information, estimated blood loss (EBL), length of stay, lymph node (LN) retrieval, and post-operative complications. P-values were determined using Student’s t-test. Results: All study patients completed a successful MIE. Five patients in the study group and four patients in the control group received neoadjuvant therapy prior to resection. The average age of the MIE group was 63 years (range 50-86) with mean BMI of 26.4 (range 20.1 to 32.1) and the average age of the control group was 64.5 years (range 55-83) with mean BMI of 24.3 (range 18.8 to 37). The mean EBL was significantly lower in the MIE group (50 vs. 495 ml, p=0.003). The median length of stay for the 2 groups was not significantly different–for the MIE group, 9 days (range 5-28 days) vs. 13 days in the control group (range 7-30 days). The median number of examined LN was higher in the MIE group—median=10 (range 7 – 13) compared to 5.5 (range 3 – 17), although this was not significant (p=0.087). The complication rate was the same in both groups (30%), and included one anastomotic leak in each group. 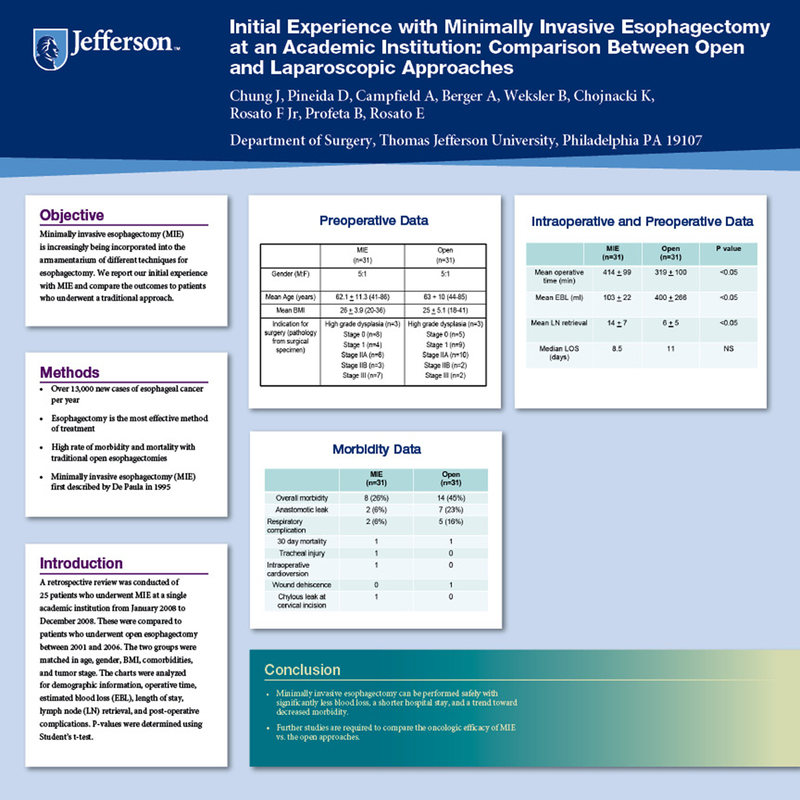 Conclusion: Our initial experience with minimally invasive esophagectomy indicates that it can be performed safely with significantly less blood loss, a shorter hospital stay, and similar oncologic efficacy. There was an increase in the operative time with MIE; however, we predict this will decrease as we gain more experience with this technique.